Underseal, stonechip repair is a durable coating is designed for Bodywork Protection and from stone chips. 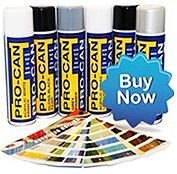 This is Overpaintable, A Etch primer is recommended for adhesion to aluminium. **Picture may differ due to brand being stocked at the time.